• Additional Test Force - 490.3, 882.6, 1373N (50.90, 140 kgf). • Total Test Force - 588.4, 980.7, 1471N (60, 100, 150 kgf). 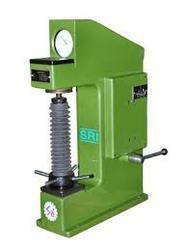 6) Our Hardness Tester confirm to respective standard as under. Tablet Hardness Tester (Monsanto type) : Useful to take quick readings from 0-20 Kg pressure for hardness. 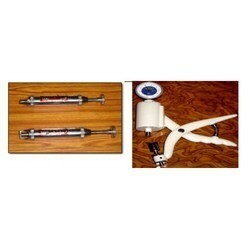 The equipment is made of brass and richly chrome plated. The index and division of reading is 0.1 Kg. Completed in box. Testing table 50mm dia 1 pc. Testing Table 38mm dia with 'V' groove for round jobs 6 to 45mm dia. 1 pc. Diamond Indentor 120o 1 pc. Stell ball indentor 1/16" 1 pc. Test Block Rockwell 'C' 1 pc. Test Block Rockwell 'B' 1 pc. Rubber bellow for elevating screw protection 1 pc. Steel Ball Indenter 2.5mm 1 pc. Test Block HB 2.5/187.5 1 pc. Steel Ball Indenter 5mm 1 pc. We are among the top most Manufacturers and suppliers of Rockwell Hardness Tester. They provide the facility of Automatic load selection with automatic zero setting dial gauges. 6 to 45mm dia. 1 pc. Stell ball indenter 1/16" 1 pc. Looking for Rockwell Hardness Tester ?